Now available directly through this site or via ETSY, EBAY or RED BUBBLE. Calendars purchased directly through me are priced AUD$10, GBP £6 or US $9 plus postage and packing. 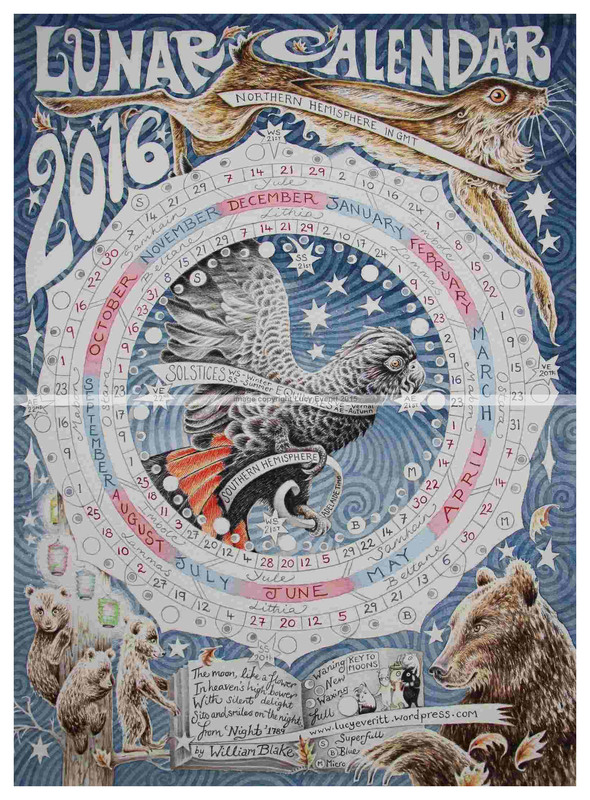 I can fit up to 5 calendars into one tube for the same postage rate, and postage is dictated by AUSTRALIA POST …. WITHIN AUSTRALIA $7.45 plus $2.45 for cardboard postage tube. TO THE UNITED KINGDOM £8.29 to post, plus £1.30 for cardboard postage tube. TO THE U.S.A $10.50USD to post, plus $2.15 USD for cardboard postage tube. The calendar is also listed on etsy and ebay. Please note the prices may vary slightly on these sites, due to listing arrangements and currency conversions. 2. Use Etsy to purchase. View my threebrownhares listing on Etsy to buy now. 3. Pay via Ebay. Just click here to go to my listing. Ebay listing for 2016 has ended. 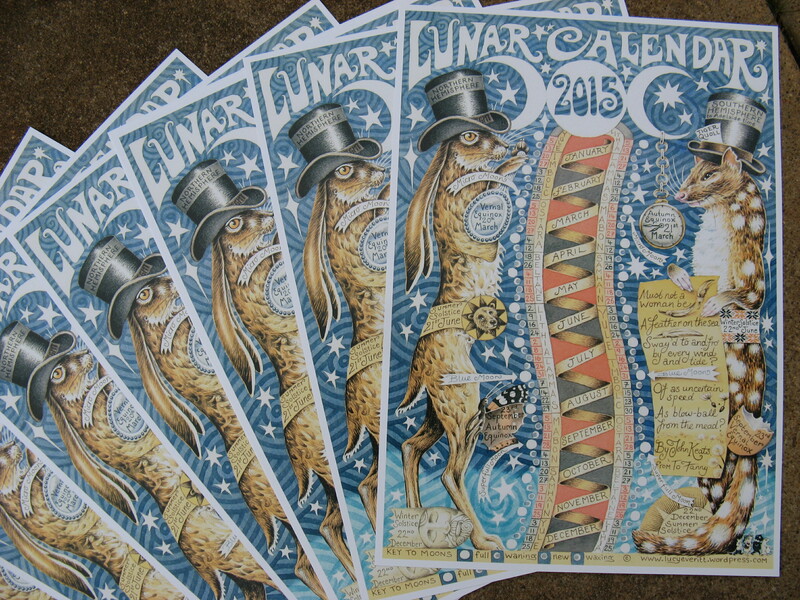 Calendars are AUD$10, GBP£6 or US$9.50 +postage and packing. You can buy directly through me by simply emailing me your address and quantity required to leverittillustration@gmail.com I will send you and invoice which can be paid through my paypal and the order posted out to you. Alternatively, use the links below to choose your purchase method. 2. Use Etsy to purchase. 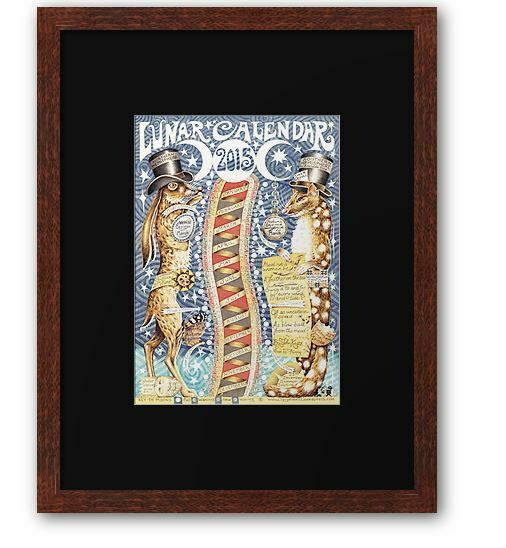 The Lunar Calendar 2015 has the Brown Hare as an emblem for the Northern Hemisphere and the Australian carnivorous marsupial the Tiger Quoll as the emblem for the Southern Hemisphere. 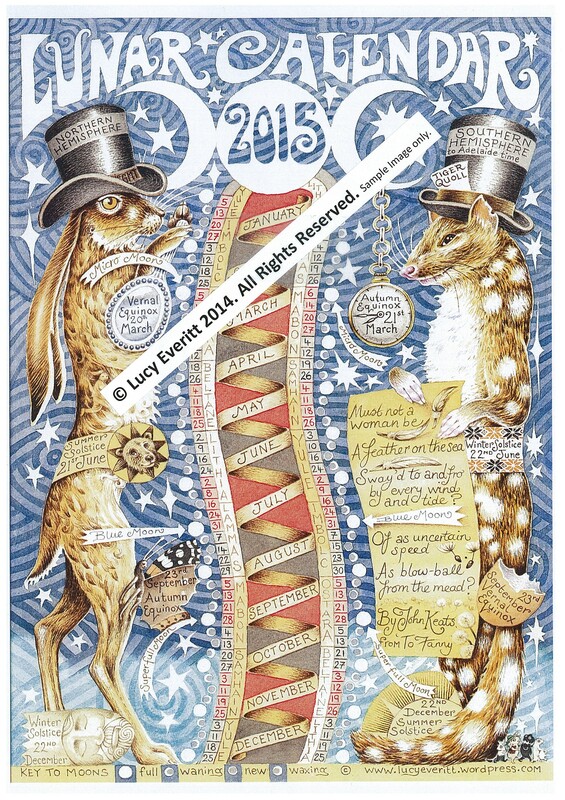 This year the calendar is in portrait format, and as last year has been printed on 300gsm satin board. Three Moons are flagged for 2015..
A March MICRO MOON. This occurs as the moon is at its furthest position from the Earth ‘apogee’ at the full moon phase. A July BLUE MOON. The third full moon of a season that has four full moons. A September SUPER FULL MOON. This occurs when the moon is at its closest possible position to the Earth ‘perigee’ during the phase of the full moon. The four quarters of the moon full, waning, new and waxing are dated in each month of each Hemisphere. The 2015 edition features an extract from a nineteenth century poem by romantic poet John Keats ‘To Fanny’ written to his lover and neighbour Fanny Brawne.